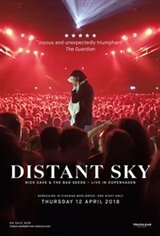 In 2017 Nick Cave & The Bad Seeds returned to the road for an acclaimed tour, starting in Australia before tearing across the USA and the rest of the World with some of the best reviews of a decorated career. Performing new album Skeleton Tree's exquisitely moving compositions alongside their essential catalogue, theband's first shows in 3 years provoked an ecstatic and passionate response in fans, critics and band alike, renewing a profound and intimate relationship wherever they played. Captured on film at Copenhagen's Royal Arena by Director David Barnard.